The monkey is a symbol of wit and humour and shows the fun side of Ardmore Ceramic Art which is based in the KZN Midlands. That quirkiness has been captured in the Celebrating the Year of the Monkey exhibition at Charles Greig Jewellers in Hyde Park, Johannesburg, running until August 29. Monkeys are often depicted as mischievous figures in myth, legend and lore – and anyone who has seen them frolicking in the wild can testify to this fact. It’s something which has been beautifully captured by Tebogo Ndlovu in a work titled Pulling the Python’s Tail. This large bowl features a python, which curls and writhes along the edge, each scale beautifully rendered along the twisting snake’s skin. Adding a playful feel are some delightful monkeys who run away from and taunt the python. Painter, Wiseman Ndlovu, has, using black and gold, added power to the slithering python and has added witty expressions to each of the monkeys, which gives the piece a lightness and playfulness. Another stunning work is Tebogo’s hand-coiled Bronco Bowl, featuring a bucking zebra, which has just kicked a monkey in his behind. Around them a troop of monkeys tumble and play in a frivolous pursuit of fun. It’s clear to see that Tebogo enjoyed sculpting this action- and comedy-filled masterwork. Painter, Sthabiso Hadebe, chose a palette of greens contrasted against black and white, for the bowl. The work has a wonderful rhythm, thanks to the colours that weave their way in and out, while the addition of delicious monster plants and cycad pods increase the jungle fever feeling. 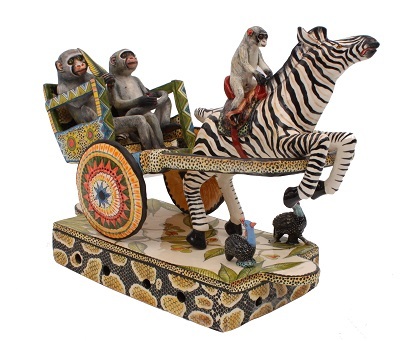 Monkeys and baboons also feature in a new range of works featuring rickshaws. The oriental feel of these works is, in part, a tribute to the Indian Hindu god Hanuman, who is worshipped as a divine protector and an embodiment of strength. The mere mention of his name is said to dispel and remove negativity. Baboons too were worshipped in the past. In ancient Egypt sexual potency and prowess were associated with the baboon gods Bebon and Baba (Babi), while the squatting baboon became an early, visible and protective form of Thoth, a god associated with knowledge and scribes. Ardmore has celebrated these gods in various works, including in a monumental urn with a baboon guard on the lid. The work, which was thrown by Lovemore Sithole, sculpted by Qiniso Mungwe and painted with wonderful baboon imagery by Zinhle Nene. Jonathan Scobie, a missionary in Japan, is widely credited with inventing the rickshaw in 1869 as a way to transport his wife through the streets of Yokohama. Some 20 years later rickshaws appeared in India and arrived in Durban thanks to sugar magnate, Sir Marshall Campbell, in 1893. There were once hundreds of colourful rickshaw pullers plying their trade in the city. The 25 that operate today are all that remain of this rich history. The rickshaw men - who journey up and down the Golden Mile in their beaded costumes and impressively horned headgear - are not the only rickshaw pullers, however. In traditional Ardmore fashion, their talented artists have created works featuring, amongst other creatures, baboons, zebras and tigers. Speaking about the latest Ardmore works, which are sure to delight collectors, Fée Halsted, founder of Ardmore Ceramic Art, said: “The artists and I have had so much fun and have enjoyed working in collaboration with Christopher Greig to produce new works for the ‘Celebrating the Year of the Monkey’ exhibition. “The new rickshaw sculptures are a tribute to the wonderful cross-cultural images that make Durban and KwaZulu-Natal unique and colourful – and our province is alive with naughty monkeys. Their energy and vitality make our province tropical, rich and spicy." Charles Greig is at Shop 13, Hyde Park Corner, Middle Mall, Johannesburg, and is open from 09h00 to 18h00. For more information contact 011 325 6881.